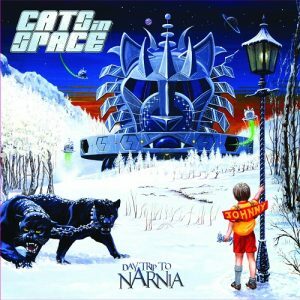 British band Cats In Space are now up to their third studio album, and continue to both amuse and amaze with their pompous brand of hard rock. The band are very stable in their line-up and this album took over a year to get to market. This time last year the band released the 'Cats Alive' album, and despite a busy year all round, it's now out the door. What do we think of it? Naturally, it's a super comfortable fit for the GDM demographic, and because we review a ton of 70's bands playing in a similar style, it finds a home easily on this website. Much like the previous two studio albums (reviewed here, click the tag below), there is a resemblance to bands like Queen, but also throw in the likes of Face Dancer and Aviary as well. The album is dominated by the seven part 'The Story Of Johnny Rocket', and though it is all part of one tome, there is enough individuality in the songs to make for a diverse listening experience. Take nothing away from the other tracks too, all familiar in style. I particularly enjoyed the lead-off 'Narnia', a true piano stomper in the pomp mould. 'She Talks Too Much' is a humour laden track, and I have to keep reminding myself that singer Paul Manzi is also the singer of a serious prog band called Arena, recently featured here at GDM. 'Hologram Man' is more of a straight-ahead rocker, while Andy Stewart takes the piano lead on 'Tragic Alter Ego', a symphonic pop workout that typifies this band to a tee. 'Silver And Gold' is a good singalong tune with handclaps, and vocal stutters on the chorus, very easy on the ear. The six minute 'Chasing Diamonds' is probably the album's most serious moment; a ballad for the first half before the lead guitars break out and lifts the momentum to a crescendo before retreating back to its chrysalis state. To promote the album, CIS will be out on tour, and will be taking Rock Goddess as support, plus a few other bands sometime and somewhere along the way during Spring. The album also gets a full double vinyl release from Harmony Factory/Cargo Records, so buyers will be spoilt for choice. If you're lucky enough to see them on the current tour, then I envy you. Enjoy the ride. Make sure to close the closet door behind you. I’m enjoying this album. I felt Scarecrow was a bit of a let down after the debut. One of the (very) few new melodic/AOR rock albums I can actually play all the way through without getting bored by track 3. Going to be checking this band out next week when they're playing a gig just down the road from me. I consider myself very fortunate indeed especially as Wimborne isn't known as the rock'n'roll capital of the UK. Pleased they've managed to put out a third studio album and agree this is more in keeping with the debut. Saw them last week and they certainly lived up to my expectations! They were every bit as good as I'd hoped they'd be - my other half is fully converted! Paul Manzi is an engaging frontman and has certainly got the pipes to match - he could sing the proverbial phone book. That said the whole band were musically excellent and they all seemed to be having a ball performing. If you get a chance to see these guys live don't miss out on the opportunity. if you love the albums like I do, then you won't be disappointed.